Galley Bay Heights #014 is a cozy, nearly beachfront villa that would be great to share with three other couples. There’s plenty of ways to stay entertained here, with two bookshelves, a HDTV, the private beach, and the gourmet kitchen. If you want to leave the villa, it’s only 10 minutes from hot spots and dining. 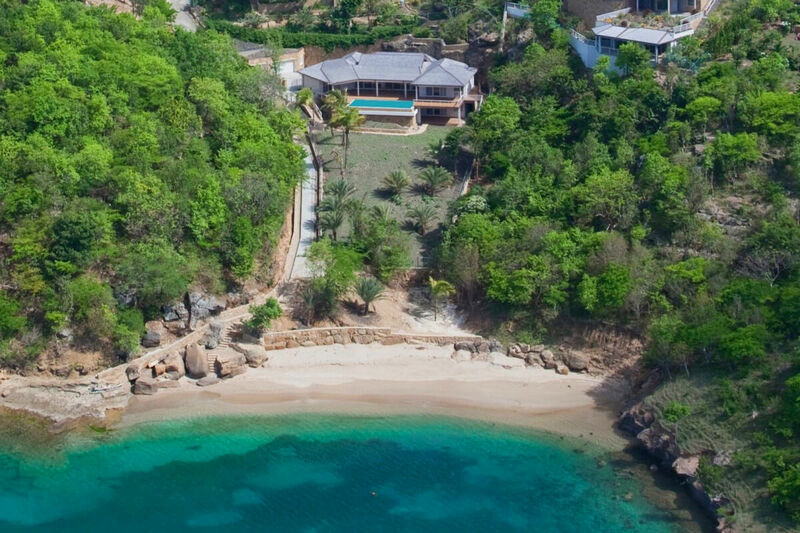 Galley Bay Heights Villa - #014 is located just above the beach in a private, secluded garden. This villa rental offers 5000 sq. ft. of living space over two levels, and features an open plan design and high-quality furnishings. A paved path leads down to the resort’s private beach and turquoise waters. The infinity pool borders the ocean view on one side and the veranda on the other. The veranda unifies the dining, lounging, and grilling areas under one roof. Sliding glass doors run along the wall and lead into the main living area, where guests can relax into plush blue sofas with a novel from the bookshelves. The air-conditioned family room has a HDTV, sofas, and a coffee table. A breakfast bar separates the dining room from the kitchen, which is well-equipped with stainless steel appliances. The villa has five airy bedrooms. All five suites have a private bathroom, air-conditioning, a wardrobe, and veranda access. The main level has two king suites and one queen suite. The lower level has a king suite and a queen suite, which share a bathroom. Galley Bay Heights is a secluded, residential community located on the west coast of Antigua. This villa is only 10 minutes from St. John’s capital and 20 minutes from the V.C. Bird International Airport. A private beach is located just a few steps away from the property. If you love to swim, from here you can swim over to the beautiful beach of Deep Bay. Otherwise, Deep Bay is just about a ten minute drive from the villa. The beach of Galley Bay is a short walk or few minutes drive from the villa, the beach of Hawksbill is about an eight minute drive. Guests will be met at the airport by a member of the villa management team. After securing the rental vehicle the guests will be led to the villa.